Manufactured by the Excel Sound Corporation who have been manufacturing cartridges for the OEM market for over 40 years (they wont tell who's cartridges are made by them! ), and branded with the name Hana, these cartridges are set to offer the highest quality sound at very competitive prices. The Hana SL cartridge is a low output MC model. Output voltage is 0.5mV at 1kHz. Hana Cartridges' highly rigid aluminium cantilever are assembled with crossed armatures to reproduce dynamic sound! The SL model has a Shibata style diamond tip. 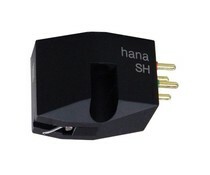 The Hana SH cartridge is a high output MC model. Output voltage is 2.0mV at 1kHz. Hana Cartridges' highly rigid aluminium cantilever are assembled with crossed armatures to reproduce dynamic sound! The SH model has a Shibata style diamond tip. 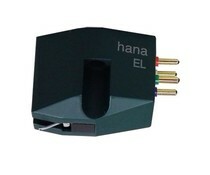 The Hana EH cartridge is a high output MC model. Output voltage is 2.0mV at 1kHz. Hana Cartridges' highly rigid aluminium cantilever are assembled with crossed armatures to reproduce dynamic sound! The Hana EL cartridge is a low output MC model. Output voltage is 0.5mV at 1kHz. Hana Cartridges' highly rigid aluminium cantilever are assembled with crossed armatures to reproduce dynamic sound!